Home › technology › Cryptogeddon – Coming Soon! I’d like to give you a heads up on a project that I’ve been working on called Cryptogeddon. I am passionate about infosec and Cryptogeddon is about to become my muse in the infosec space. In a nutshell, Cryptogeddon is an online cyber security war game. 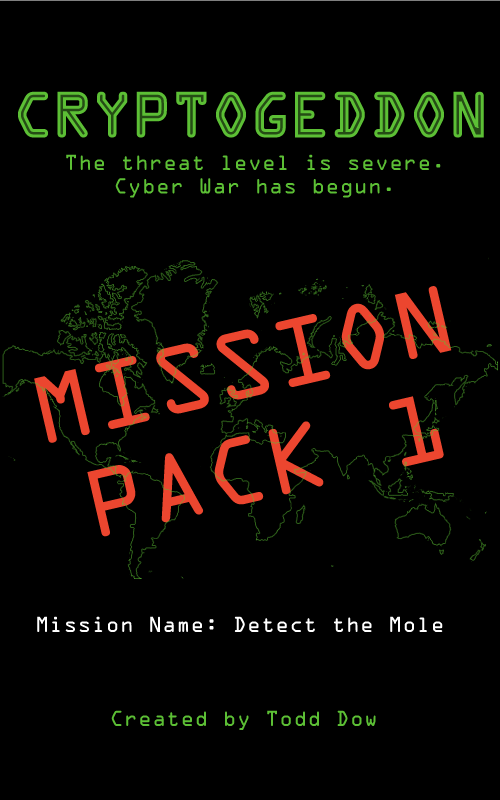 The game consists of various missions, each of which challenges the participant to apply infosec tools to solve technology puzzles – an online scavenger hunt, if you will. Each mission comes with a solution that teaches the participant which tools to use and how to apply the tools to solve the mission. Solution – This section outlines the steps to complete the mission. Some people will ignore this section until they’ve completed the mission. Others might need to take a peek to help get through a particularly tricky part of a mission. And others might rely on the solution as a training device to help walk them through the entire mission. Mission packs will be sold individually, with a possible “combo pack” available once I get sufficient missions available for sale. I haven’t settled on final pricing yet, but each mission will be $4.99 or less. I am launching this game within the next week or so – I am just applying the finishing touches to my first missions and finalizing the public facing website for this product. Software Hamilton: I will be providing an overview of the game at Software Hamilton’s Demo Camp 13 on Sep 24 2013. At DemoCamp 13, I will be giving a 5 minute overview of this project, followed by 5 minutes of Q&A. You’ll be able to pick up some swag (Cryptogeddon logo stickers) at the event as well. Sector: I have been invited to speak at Sector (Canada’s Premier IT Security Conference) on Oct 8 & 9 to share this project. At Sector, I will be giving a 1 hour talk where I walk the audience through “Cryptogeddon: Sector 2013 edition” – a special mission for Sector that anyone will be able to download for free. At this session, I will walk the audience though the mission, demonstrating the various infosec tools needed to solve the challenges presented in the mission. And, in addition to my “Cryptogeddon: Sector 2013 edition” talk, all Sector attendees will receive a Cryptogeddon logo sticker in their conference bags. I encourage you to sign up for the mailing list at http://cryptogeddon.com/, follow @cryptogeddon on Twitter and check out the first missions as soon as they are released. And, I encourage you to come out to Software Hamilton’s DemoCamp 13 to show your support and to hear from some other interesting local speakers with some great products to share. And, I highly recommend that you register to attend Sector – there will be a lot of bright infosec minds in attendance – I always come away from Sector with a ton of great learnings. Sector is definitely my favourite infosec activity each year. Stay tuned for more info on Cryptogeddon in the coming days! ‹ The God Solution – Wrap Up!